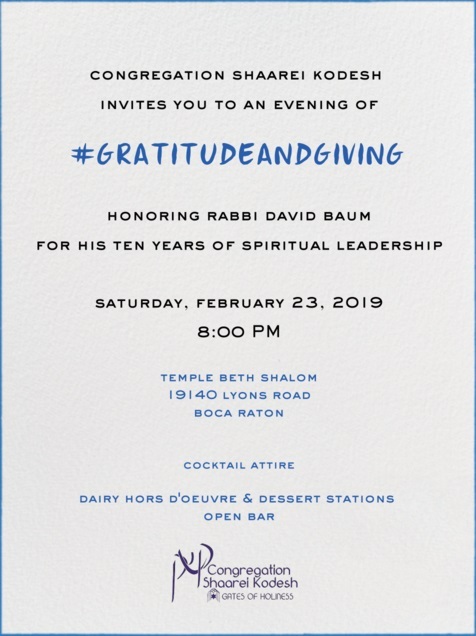 Congregation Shaarei Kodesh invites you to an evening of #GratitudeandGiving honoring Rabbi David Baum for his ten years of spiritual leadership on Saturday, February 23, 2019 at 8:00 pm. Use this form to select a sponsorship level. Click here to download and print the invitation. All sponsors will be recognized at the event, on our website and in email communications.